I do not like mushrooms! I’ll eat them if the flavor isn’t too powerful but I prefer not to. Enter portobello mushrooms, I have been won over. Today I made another batch of portobello fajitas, a pasta bake containing portobello’s, and I’m baking some portobello slices now as well. I have heard a lot of people commenting about mushrooms being a good stand-in for meat but as a former mushroom hater I wasn’t having it. Now I can see it! I’m reformed and embrace the mushroom, especially served like this. Remove the stem and slice mushrooms. (If you are making Portobello steaks you can leave just remove the stem). Mix the remaining ingredients together and allow the the mushroom and veggie slices to soak in the marinade for 30 minutes or so. 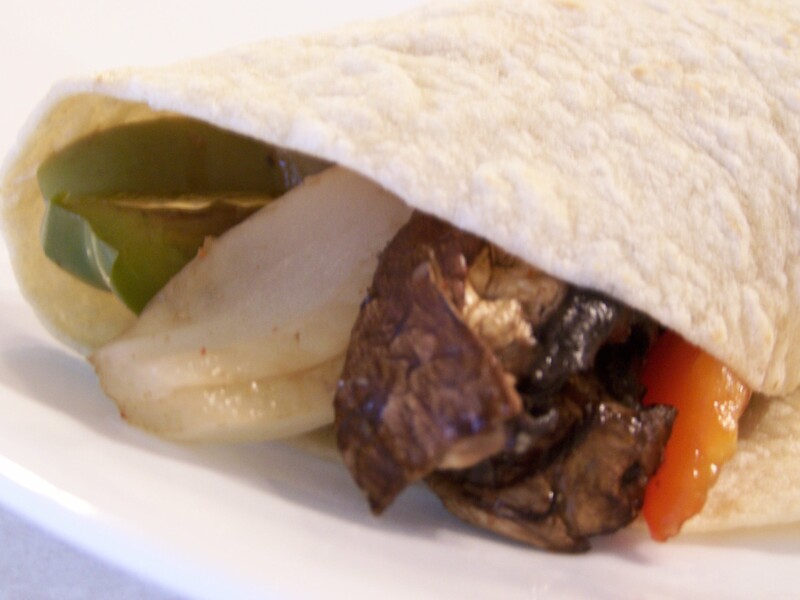 Broil the mushroom and veggie slices for 4-5 minutes then flip and broil for 4-5 more minutes. These are great served in a warm tortilla. I love them even more with fresh guacamole and salsa but they are good plain too. You could also top a salad with these and even add roasted corn! YUM! Does this look like a steak fajita or what? Have you embraced the shroom and if so how do you like it? That looks delicious! I have come to love portabellos as well. Sometimes I even find myself craving them. It is a very good tasting stand in for meat. Thanks for sharing! Welcome to the wonderful world of (portobello) mushrooms!! I, too, used to hate mushrooms, but now I enjoy them! Shitakes are my favorite, but I like baby bellas, too. I recently found out that I’m severely vitamin D deficient, so I’ve begun to eat mushrooms weekly since mushrooms are a great source of vitamin D! I have a question for you – with the big portobello mushrooms, do you scoop out the dark stuff on the underside of the mushroom, or leave it there? I’ve used both approaches in cooking them, but just wondering what you did for these fajitas. I did not scoop out the “gills” they looked kinda gross to me at first but I did not have a problem eating them. I wont bother in the future either since I liked them this way. Yum, yum, yum…it is almost lunch here and those look so good! Hmmm… Interesting. I have a hubby who gags at the sight of mushrooms, but if he doesn’t know it’s in there (if I don’t put too much in, say, a sauce) he can handle it. I should try this recipe to see if I can reform him, at least on Portobellos. I noticed he does better if I scrape off and rinse the underside “gill” like parts before adding them. I tried this receipe with my family – husband, kids (11, 7, 2) and honestly was not hopeful the kids would eat it. Much to my surprise they ALL LOVED it! My son (age 7) had 4 fajitas and the 2 year old finished off 3. I am so excited about your recipes and blog! thank you!! Thank you Brandy! I can’t tell you how happy I am to hear your family loved them! You should try the mushrooms on pizza too, delicious! I hate mushrooms as well. Will have to try this one & see if I can sneak a few into my diet. 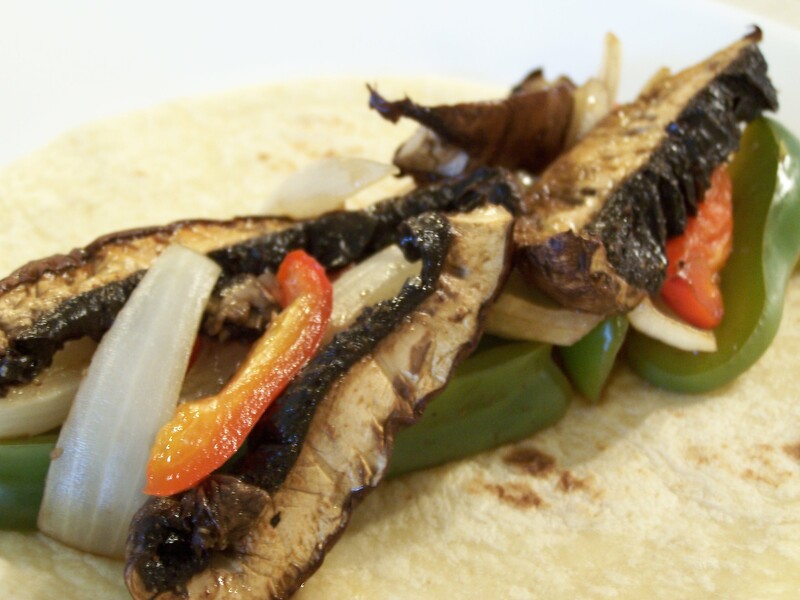 Do you broil the peppers and onions with the mushrooms? Yes Kariann, I do. Sorry about that omission. I just updated the recipe to include that step.